Like its predecessor, on Lower Morden, this large-format booklet devotes each of its 15 double-spread pages to a separate theme. After useful discussions of four key periods in the early history of the district, and an explanation of Merton Priory’s estates at the Dissolution, there are lucid histories of each farm or other piece of land that together made up the western part of Merton parish and the immediately surrounding area. For each there is at least one map, the outline of each land-holding being superimposed on a modern map. The narrative is clear, and throughout there are nicely varied illustrations. West Barnes covered the areas now known as Raynes Park and Motspur Park. 2000. All profits from its sale go towards church funds. Accounts of 1538, and then the subsequent history of each estate, and its sub-divisions, is followed into modern times. Design Unit (London Borough of Merton) for permission to use their current street map. Merton Library and Heritage Services for the use of Miss Jowett’s photographs in their collections (marked MLSC). Stephen Day for permission to reproduce the postcard view of Hoppingwood Farm from his book Malden ~ Old & New. Malcolm Claridge and John Goddard for modern day photographs (marked with initials). notes of the late John Wallace, whose knowledge of the history of this area is unlikely to be equalled. John Pile of Merton Historical Society for tracings of the Tudor ‘plotts’. Surrey Archaeological Society for permission to reproduce the map of Malden in 1627 from their Collections Vol.41. Surrey (1974) and Rocque’s Exact Survey (1971). Other illustrations come from 19th- and early 20th-century publications. Apologies are offered for the inevitable errors and false assumptions, which will hopefully be corrected in due course! Copies are available from Peter Hopkins, 57 Templecombe Way, Morden, Surrey SM4 4JF at £2.50 including postage. indicate a settlement by the road, perhaps a staging post. Some think there may have been Roman settlement in the Blagdon area. Mertonto Ealdorman Ælfheah and his wife Ælfswith. By 1066 the estate was in the hands of Earl Harold, who became king on the death of Edward the Confessor, until his defeat at Hastings. House (now the Civic Centre). Evidence of Romano-British settlement has been found near St Helier Station. The name is Saxon, meaning “hill in a swampy place”, and its location between the Wandle and the Pyl and East Pyl brooks bears this out. Land south of the Crown was still called Marsh Close in the early 1800s. given to Westminster before the Abbey was refounded by St Dunstan during the reign of Edgar, and that the grant was confirmed by Edgar in AD969. A hide was a notional unit of tax assessment, also known as a carucate or a sulung. to Hilbert from the enclosure of the Common. In 1818 Hilbert’s nephew, William Tate, inherited the property, followed in 1834 by John Hilbert Tate, the son of another of Hilbert’s nephews. In the late 1870s William Rayne, son of Edward Rayne late of West Barnes Park (see p.8), was tenant, the owners being the Whatley family. Rayne also farmed the nearby Cannon Hill Farm, which had recently been added to the Cannon Hill estate. farm run by the Berkshire family. former Sandpittes or Poors Wood. 100 council homes were built in Cannon Hill Lane and the extension of Whatley Avenue. “late in the occupation of Thomas Hickson”. death. John sold it in 1651 to Richard Aldworth. William Head, who owned the property called Our Lady House in Merton. farm was offered for sale. The tenant was then Benjamin Umphelby. evidence of its Saxon foundation. It stands 93 feet (30m) above sea-level. Chessington and Leatherhead, which belonged to Chertsey Abbey in 1086). shows that it was frequented by nomadic hunters over 5000 years ago. One hand axe may even date from the Paleolithic era. Course. The villagers grew crops, kept sheep and cattle and wove cloth. urns, pottery and other artifacts. The name Coombe is Saxon, meaning a valley on the side of a hill. hops grew. Fields on both banks of the brook retained the name. called Mott’s Furse Farm, and may have been named after Henry Mott. owner of a free tenement then in the possession of John Vincent. in Morden, while the land to the south is in Cheam. referring to a meeting place. Another related word is moot. became the property known in the 19th century as Fullbrooks. suggests that an important burial mound stood here at the time. hundreds and four parishes extending their boundaries to converge here. what and how much each man who was holding land in England, in land, in livestock, and how much money it was worth. edited and published by a team of scholars working under the direction of John Morris, and the following extracts are from this edition. £35; however, its holder pays £43. The observation that the holder of the manor paid more than its value suggests that it was leased to a tenant at this time. A sulung was the Kentish equivalent of a hide. 60s = 60 shillings = £3. John Watney is listed as the owner/occupier in Merton Land Tax records of 1805, but by 1810 Cannon Hill was owned by Thomas Sherwood. In 1814 he took a 20-year lease on Lower Morden Farm, but “cleared all off and ran away by Michaelmas Day, 1828”! but the empty house became dilapidated and was pulled down. Page bought the whole property around 1840, but no buildings are shown here on the 1844 Tithe map. The farmhouse appears on the 1860s Ordnance Survey map, and in the 1871 Census. William Rayne farmed here and at Bakers in the 1870s. though it had never been part of the common land of the manor. various closes and built Eastway. New Ideal Homesteads completed Blay’s estate around 1939. Cornwall started to sell off the separate properties. them in 1624 to Rowland Wilson, a citizen and vintner of London. Hill estate, or possibly Merton Hall Farm land south of the Common. Morden and the woodland that became Cherry Wood. shrubberies, etc. and the soil is stiff black clay”. well as some lands from John Middleton of West Barnes Park. 40s. Value before 1066 £6; now £10; however, it pays £15. hides allocated to Morden in the Domesday entry. The fact that it paid more than its value suggests that it was leased out. 3 ploughs. In lordship 1; 6 villagers and 1 smallholder with 1 plough. Meadow, 4 acres; for grazing, 4 pigs. Value 60s. Humphrey the Chamberlain holds COOMBE from the Queen’s holding. this land put herself in the Queen’s hands with it. acre. Total value before 1066 £7; later 100s; now £6 12s. In MALDEN 1 hide which Robert of Watteville holds, remains in dispute. and invited the sub-prior of Huntingdon Priory to serve as prior. The allocated site did not prove to be suitable, and a new site was chosen by the River Wandle. the land had come into the hands of the prior, and large farms were created and leased to tenants. Merton Priory had held an estate in Lower Morden, or Westmorden as it was then known, from the early 13th century. William de Wattune was listed among the freehold tenants of Westminster Abbey around 1220, holding 1 virgate. In Morden, a virgate was customarily 20 acres. At the beginning of the 19th century Hobalds was augmented by the addition of lands which had formerly been part of the farm leased to William Mollison of Cannon Hill. formerly farmed by Richard Dallett. By 1818, when Hobalds was to be leased to William Watts it totalled 229 acres. However, the lease was never delivered, as Watts “ran away”! in Merton and over 16 acres in Malden. to J J Bishop, founder of the removals firm. Richard Garth in the 1860s. boundary changes in 1995 transferred it to Sutton. Ancient boundary ditches and hedges still separate these fields from the cemetery within Morden parish. The Four Acres estate was built in 1980 on land not required by the cemetery. The Catholic Schools and the sports grounds occupy the former Hobalds and Twyry Meads. bought the West Barnes Park estate in the 1860s (see p.8). 140 acres, of which 30 acres were in Malden and 30 acres in Merton. bought from Thomas Cornwall in 1607.
odd rectangle of Malden land on the east bank of the Beverley Brook. It was generally known as Hyde Hill. came to be known as Lower Morden Farm. manor was called Coombe Nevill. lands by the old tenure of collecting the Queen’s wool. up by the Archbishop’s men, and were accused of sacrilege and heresy! of the Great Seal in 1258, and Chancellor of England from 1260-62.
up a college for them and other young clerks. was vested in the community itself. maintenance of the scholars at Oxford, and other male relatives. Malden to Oxford, though the income still came from the manors. parcel by parcel, completing his purchases in 1598.
and formed the later Blagdon Farm. centred on Bakers tenement, were situated together between Cannon Hill Lane and West Barnes. they reverted to the Crown. Elizabeth I leased them to the treasurer of her household, Gregory Lovell. Nutcars Farm, but the Greenwoods’ map of 1822-23 shows it as Motspur Farm. re-routed West Barnes Lane, where he had already built Ivy House and Dudley Lodge. Meanwhile Judas Field had been sold to the owner of Blue House Farm. whose daughter married Charles Blake after the death of his first wife. Blake rebuilt the old Motspur Farm farmhouse and erected four others in his new road, and more in Malden Road. Two of these houses survive along Motspur Park. ground, formerly the University of London Athletic Ground. The sports grounds now occupy about a half of the former farmlands of Motspur Farm. Most of the later housing in the area was by Sydney Parkes’s Modern Homes and Estates Ltd, who also developed the former Blue House Farm lands (see p.9). called Malden Road was then called Fursen Lane. Charles Goode sold the lease in 1672 to Sir Thomas Morley. Mottes Furze Farm in Malden to Robert Carpenter of Merton. 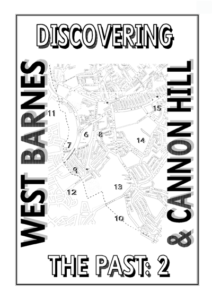 had divided the old West Barnes estate among his sons in the 1660s. West Barnes to his nephew, James Carpenter, father of young Robert. occupier of the 4-acre Judas Field, the last of the Carpenter possessions. The Survey also shows Willis’s tenant at Motts Furze Farm as Machell. and lands called Appuldore in Maldon and Kyngestone. Fromond family held the manor of East Cheam. making the grant, and the lands returned to the Crown. In 1562 Elizabeth I sold the estate to Lawrence Stryfe and Thomas Reve. that farm until modern times. neighbouring estate since the 14th century. Marquis of Exeter, at £16 a year. He was executed in December 1538.
execution was given to William Cecil, later Lord Burghley, in 1552.
of Appuldore, and later Hoppingwood Farm. earliest known large scale maps of the area. wood for fuel and fencing. preserved in the Public Record Office. land. These formed part of his Great Park of Nonsuch. in whose name the manorial court was held in 1579.
possession of the Goode family until 1672.
and these accounts are in the Public Record Office at Kew. The first year’s accounts describe the estates in some detail. The entries have been given a code letter to enable the provisional identification of each property on the map, based on Ordnance Survey maps of 1871-74. John Galsworthy, the father of the author of The Forsyte Saga. Malden’, was opened in 1846, and led to the creation of New Malden. The first roads to be created were the six Groves, laid out in the 1850s. Gardens, and Camberley, Somerset and Taunton Avenues, built in 1925. Detail from John Rocque’s Map of Ten Miles around London,1741-45. Unfortunately, Hoppingwood was on the join of two sheets which don’t quite match! 1651 was forced to sell the manor. daughter Elizabeth, wife of Sir Daniel Harvey. hands until Thomas Cornwall started selling off the separate properties. Carters Lease from Cornwall in 1607. Marlborough, had inherited her manor of Wimbledon in 1744.
century was Thomas Watney, followed by Matthew Watney. called Appuldore £10 0s. 0d. as demised by indenture to Thomas and Geoffrey Bedle 31 August 1536. When John Carpenter died in 1611, his will divided his properties between his wife and two sons. to his youngest son, William. Other properties went to his middle son, Robert, who also received John’s share on his death in 1658.
divided equally among John’s six children after John’s death. who had taken over the lease on the death of his father George, but when it was sold in 1737 it was on lease to another James Carpenter. bought the rest of the farm. who was herself a substantial property owner. The early 19th century saw a movement towards enclosing waste lands. cottagers have large families and will be wholly deprived of firing which at present they enjoy from the Common. That it is not in their power to purchase coals and other fuel and will drive them to the greatest distress”. bought for the Cemetery, and the Council later bought more land for the Refuse Disposal Depot. Garth Road and its closes were soon lined with houses and maisonettes. Lincoln and Washington Roads in Worcester Park were built by the British Land Company Ltd in 1865-66, on two of the allotments from the enclosure of Cheam Common. Norbiton Common was built over between the 1860s and early 1930s. tenants in exchange for Combestrowd Meade, south of Coombe Lane. delivered out the owner to pay the usual charge. Approach Road now covers the Sandpits, later known as Poors Wood. the right to its own tithes, so Hills paid his tithes to Holmes. building a new farmhouse on land now occupied by Malden Court. corner of the Pitles, adjoining Poors Wood, in 1871.
as is the land north of the railway line. Pyl Brook in 1921, occupied since 1987 by Tesco. houses along the A3, and in Aboyne Drive and Firstway. Blagdon was the first part of the old West Barnes estate to be separated. payment of 52 shillings a year to the poor of Merton. on which Nelson’s Merton Place was built was sold by them in 1699. Blackdowne to his son Matthew, who was already in occupation. Hall Farm. He also owned two small freehold cottages in Lower Morden. The family later bought several copyhold properties in Merton. and Southside Wimbledon, and in that year he left it to his son Francis. who was followed by John Watney until 1814.
continued as his tenant until 1814.
already tenant of the adjoining Motts Furse Farm by 1794.
develop his land for housing. having been condemned as unfit for occupation. and Arthur Road were named after Parkes’s children. is occupied by sports grounds. corner would have been cut off from the main farm. and premises situated in the parishes of Cheam and Malden”. Surrey in 1793, reproduced below. of 120 acres in Merton, 80 acres in Kingston and 16 acres in Malden. The tenant was Edward Rayne, who also owned West Barnes Park. that the sale had only just taken place. 1891 Clement Keevil ran the Blagdon Stud Farm for shire horses. Engines and Champion. Now most of the sites are retail developments. Palmer, who lived at Blagdon until around 1920.
his four youngest sons, Nicholas, William, Charles and Thomas. They did not farm it themselves, as it was leased to Nathaniel Chalkhill. Chalkhill was one of the original trustees of Merton’s Rutlish Charity. near the Pyl and East Pyl brooks. of Parliament in the 1750s but was defeated in the election of 1761.
the 1780s Budgen’s tenant farmer was John Cross. Dutton, who already farmed at Hobalds. in the Tithe Survey. However, the sale map of 1833 survives. which it stood was never part of the Rayne estate. The early 1900s saw more varied properties. after the War by New Ideal Homesteads. of the eastern boundary of West Barnes Park. This entry was posted in Publications, Discovering the Past, Publications and tagged in 17-century Merton, 18-century Merton, 19-century Merton, 20-century Merton, discoveringpast, medieval Merton, merton, Norman Merton, Tudor Merton, west barnes.